This may go against my golden rule of natural lighting, but dinner at Alden & Harlow is too memorable not to be shared. Among Chef Michael Scelfo’s many awards are Best Restaurant in the World (Conde Nast Traveler, 2016), Best Restaurant, General Excellence (Boston Magazine, 2016), Best Restaurant (Boston Magazine, 2015), Beard House Recipe (James Beard Foundation, 2015), and countless awards for their burger alone. Chef Scelfo’s dishes are modern, yet inspired by home-cooked meals with his family. His menu is complimented by an upscale yet intimate subterranean venue in Harvard Square, with plush booths and industrial lighting. While their burger was sold out the night we were there, there were no shortage of interesting and scrumptious plates. 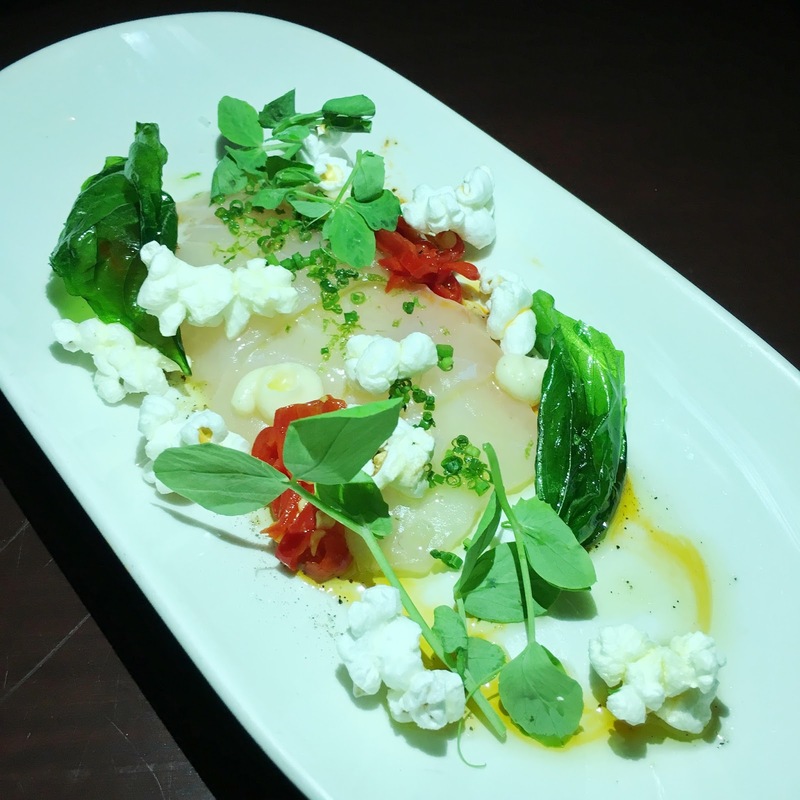 Our first dish was the striped bass crudo. Whenever we see crudo on a menu, it’s almost a given that we’ll order it due to our appreciation for ultra fresh, bright plates. This one in particular came with a unique popcorn crema, basil, lime and Calabrian chili. What a perfect example of Chef Scelfo’s modern and upscale dishes with a home-inspired spin (this time it’s the humble popcorn). Next we had the self-described “Ubiquitous Kale Salad,” which is another plate we will almost always order since it’s super healthy and every restaurant has it’s own take on it. Alden and Harlow puts a creamy spin on it, with pistachio dressing and honey. It’s supposed to also come with fennel but I can’t stand the stuff, so we had it held. 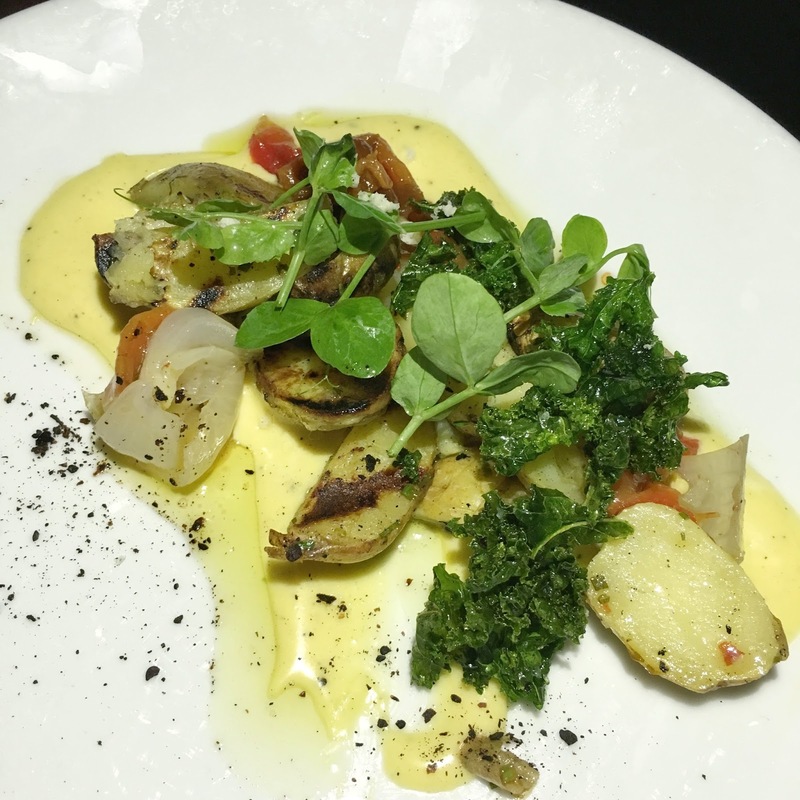 We loved this plate, and the creamy texture was perfect juxtaposed with the structured kale leaves. 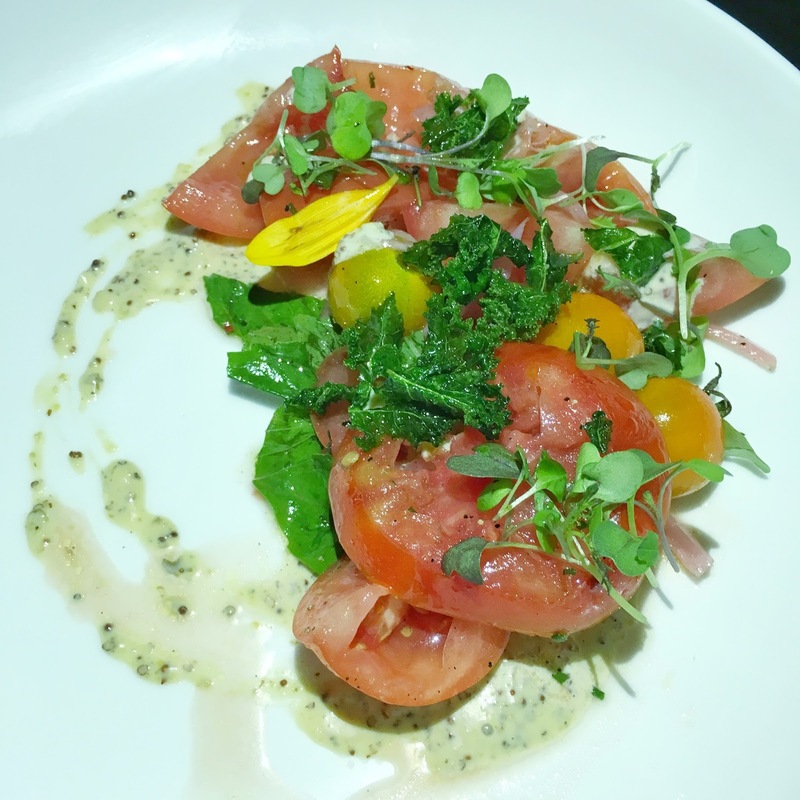 We also tried the Heirloom Tomato Salad, with anchovy and mustard aioli and basil. It also comes with fried bread which sounds heavenly and I’m sure add more substance to the plate, but since we’re gluten free we held that one. The tomatoes were very fresh and I loved the aioli even though I’m not a fan of mustard. It was so good we sopped up every last drop with the tomatoes. It may not look like much, but this was our favorite plate of the night! The Grilled Local New Potatoes are a must try at Alden & Harlow. They come with smoked egg aioli (how interesting is that? ), horseradish (very mild, not overpowering at all), cipollini and pepper caponata. You can tell that this is inspired by a side of potatoes at home, but again made for a modern and hip restaurant. It’s hard to explain just how, but we immediately decided that these were the best potatoes we’ve ever had, and this sauce never stood a chance at escaping our bellies! 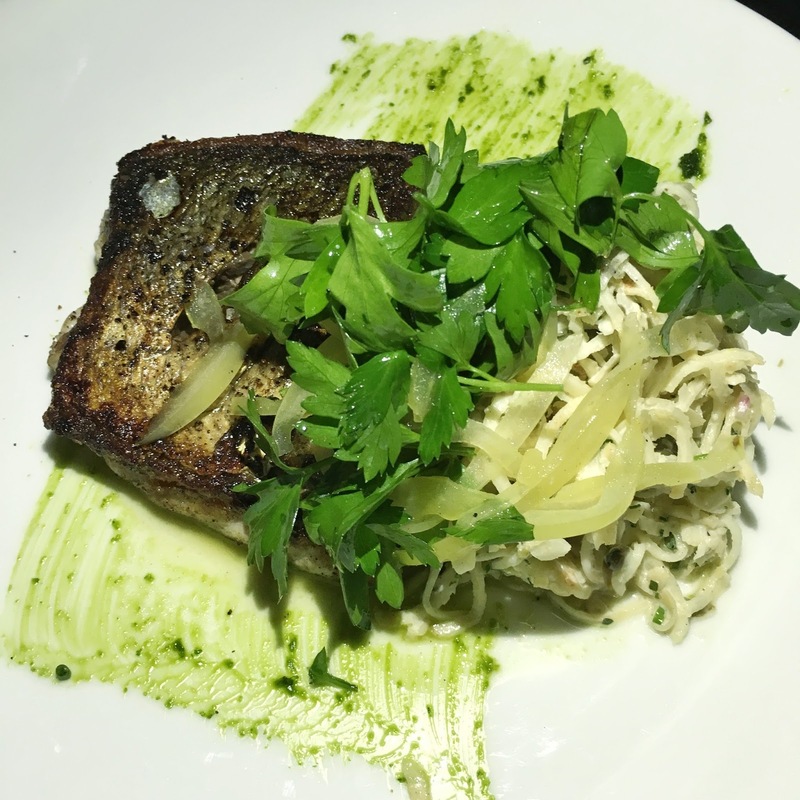 Finally, we ordered the grilled bluefish, with celery root, remoulade, and pickled green tomatoes. This one was good in my book, but the potatoes were such a tough act to follow! I know the James Beard Foundation prefers another house recipe, but if I had to take home one it would be to that potato plate! Apart from a few hiccups, like missing out on the burger and hearing our waitress tell the specials to the family next to us but not to us, we enjoyed trying the small plates at Alden & Harlow. I plan on returning sometime soon for brunch and hopefully catch the burger! Stay tuned for that review! Comment Challenge: What home-inspired ingredient would you want to see on the menu at a nice restaurant?